I have witnessed the glowing of the woman's face when she saw her husband, who simply said "Happy Anniversary." She didn't care for the lack of flowers, or gifts in his hand, because it was the first time in 16 months she has seen him. He just returned from a tour of duty in the "big sand box". I had chills when I watched this, actually I had to wipe my tears, since these homecomings just take a toll on me. They kissed and hugged for longer moments than any other time in their lives. The world stopped for a moment, I swear it did. I heard him say,"Happy Easter, Happy Birthday, Merry Christmas, Happy New Year with other kisses he laid on her forehead. I had to take a step back.. and get another tissue. I listened and watch other soldiers and their loved ones hug, kiss, slap one another on the back for jobs well done. I could feel the love, the excitement and sighs of comfort from the people. I know someday soon I too will rejoice in the moment. Here is what transpired from that days events. 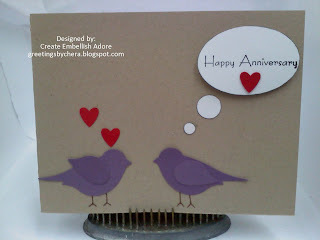 .. two love birds, saying "Happy Anniversary." The birds are from the SU two step bird punch - which is a new design punch! Oh this is just too cute!!! This is a great card, and I loved the intro story. Thank you for sharing with us! This is a beautiful card! Don't you just love that punch! This is really pretty how you used it. And your story is fantastic!